@knityorkcity the funny thing is i have an idea in my sketchbook that fits all three. no such thing as oversaturation! The tweet that started it all. Over a year and many yards of neon yarn later, Sarah, Teresa and I are pleased to present Neon Neutral Triangle Club to you all! Our awesome logo created by Kirsten Hipsky! The theme is pretty straightforward: neons, neutrals and triangles. We each designed one accessory and one garment based on our interpretation of the theme, and enlisted some killer yarn companies to support them. Because let's face it: when you are doing a collection about neon, you need some NEON. My accessory design is Triangle Inception and it features some fancy-pantsy yarn from Rain City Knits. I wanted to showcase a bright variegated colorway since I feel like those types of yarns are often neglected. They're definitely harder to design for and knit with, but they're beautiful too! I met Krista at TNNA in 2014 so she was fresh on my mind when I was thinking of neon yarn options. I love supporting indie dyers! You can tell these photos were taken awhile ago because my hair is totally different now! It's a really simple triangle shawl with a garter stitch body and knit-and-purl triangle border. The white spokes are formed by slip-stitch surface crochet after the shawl is complete, and it's easy to get the hang of even if you aren't a crocheter! Plus the RainCityKnits Super Sock MCN base is lush and very pettable. Acute-ly Preppy is my garment design and ohmygod I'm SO HAPPY that we managed to get a jumping shot during this photoshoot! I've worked with the folks at Fairmount Fibers before (the US distributors of Manos del Uruguay yarns) and they are just fabulous, so I was really happy when they agreed to support this venture. Maxima is a great squishy single-ply merino that has punchy neon colors, making it a no-brainer choice. I will warn you--this is a labor of love, product knitter type sweater. It's knit flat in pieces and seamed, which a lot of people already dislike, but that means the front panel has both right side AND wrong side colorwork going on. I personally didn't find it bad at all, though since I designed it I'm clearly crazy and my opinion can't be trusted. Essentially, the front panel is stranded so you're carrying your colors across both RS and WS rows, but it's set within a larger piece intarsia-style. You knit across the front to the beginning of the panel, twist the yarns around each other when working intarsia, strand both accent colors across the panel, and then twist around a separate ball of the MC to finish working the other side of the front. Since the front is so complicated, there's no shaping and everything else is straightforward. The back neck is shaped the same as the front for a cute V-neck back. So if you wear a bright tank underneath, you'll have a little neon surprise back there! I also want to thank two special people that contributed. 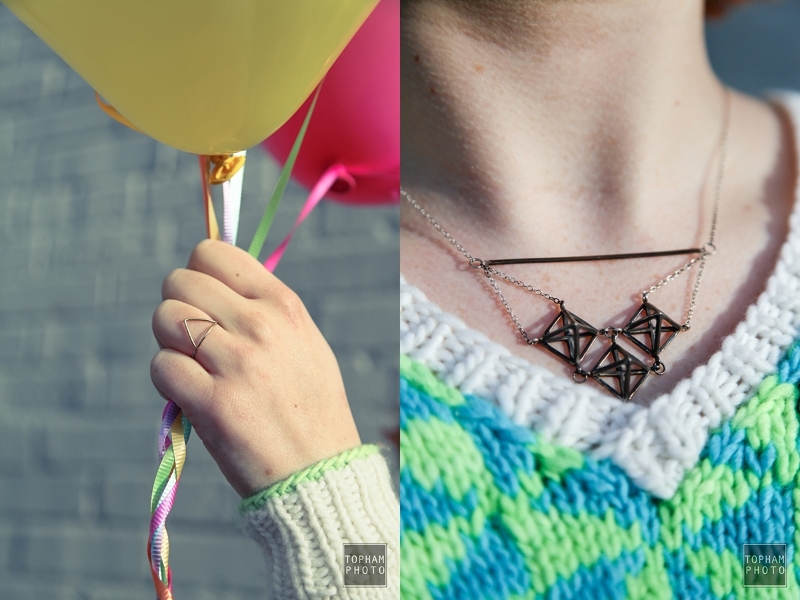 First is my friend Elisabeth who graciously lent me some of her handmade triangle-themed jewelry (see above) for the photoshoot as the perfect accent. You can see her work at metal & rocks. The other person is Kirsten Hipsky, who created our ebook layout for us and did a fantastic design job. If you buy a copy you'll see what I mean! Neon Neutral Triangle Club is available on Ravelry as a full 6-pattern ebook for $24, or you can purchase the patterns individually.